suppurative diseases of the respiratory system; burns, bedsores, trophic ulcers, purulent wounds. hypersensitivity to Chymopsin. Chronic heart failure II-III degree, malignant neoplasms, pulmonary emphysema with respiratory failure, pulmonary tuberculosis (open form), degeneration and cirrhosis of the liver, viral hepatitis, pancreatitis, hemorrhagic diathesis. Do not apply into the bleeding cavities, to apply on ulcerated surfaces of malignant tumors. empyema of the pleura of tuberculosis etiology (resorption of exudate may in some cases contribute to the development of bronchopleural fistula). Use during pregnancy and lactation: no data. with respiratory diseases, the drug in a dose of 25-30 mg is dissolved in 5 ml of distilled water and is injected into the respiratory tract through an inhalation device, a bronchoscope, an endotracheal probe, and a tracheostomy tube. The number of inhalations – from 1 to 3 times a day for several days, depending on the evidence. Antibiotics, bronchodilators that enhance the action of Chymopsin can be added to the drug solutions. In chronic rhinitis, instill or irrigate Chymopsin’s nasal cavity 2-3 times a day (5 mg in 5 ml of 0.9% sodium chloride solution). In chronic purulent otitis, complicated by cholesteotoma, after washing with 0.9% sodium chloride solution, a 0.5% solution of Chymopsin (per 0.9% sodium chloride solution) is instilled into the ear 2-3 times a day. For thermal burns of grade III, a thin layer of Chymopsin is applied at a rate of 1 g per 100 cm2 of the wound surface and covered with a bandage moistened with 0.9% sodium chloride solution or 0.25% procaine solution. A moisture-tight dressing is applied on top to slow down the drying of the dressings. The dressing is changed every other day. In the treatment of purulent wounds and bedsores, the drug is used in doses of 25-50 mg (in 10-50 ml of a 0.25% solution of procaine). Sterile gauze tampons are moistened with the solution and applied to the wound surface for a period of 2 hours to a day depending on the thickness of the purulent-necrotic masses. Headbands with Chymopsin change every 3-5 days. 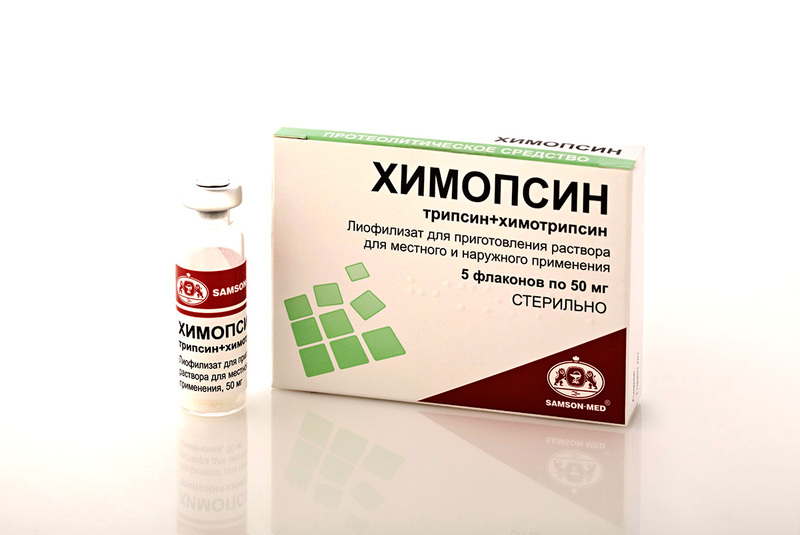 In the treatment of ulcers, burns of the cornea and keratitis, Chymopsin is used as eye baths in a solution of 1: 500 daily for 2–3 days or as drops of a 0.25% solution (prepared ex tempore) 4 times a day for 1–2 days 2 drops.